Things were very busy in February and blogging was the first thing at the bottom of my to do list! Blogging is such a mental exercise for me so it is one of the easiest things to skip. Don't you feel that way? This is the last month for the Sale-A-Bration catalog. I am really going to miss showing off these stamp sets, paper, glitter tape, Project Life (TM), and glitter tape. Oh, did I mention Metallic Glitter tape? Place your order before the end of the month and receive one of these free Stampin' Up! products with every $50 purchase. Click the link on the right for the catalog. I must admit this first club card was a little easy since I took advantage of a sample in the SAB catalog using another image from the Honycomb Happiness stamp set. I made my own Designer Series Paper too! It is hard to tell from the photo (terrible lighting) but I used the paper piecing method for this cheeky chick. First, I stamped the chick with Basic Black Archival Ink on Whisper White cardstock for placement and his feet. I colored the feet with Tangelo Twist Stampin' Write Marker. 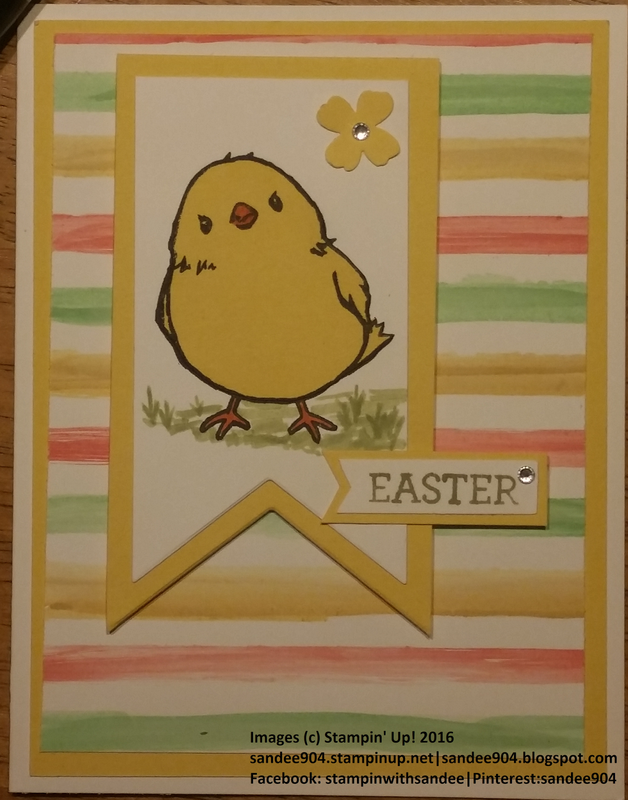 I stamped the chick a second time on Daffodil Delight and fussy cut the main body not quite removing all of the outline. 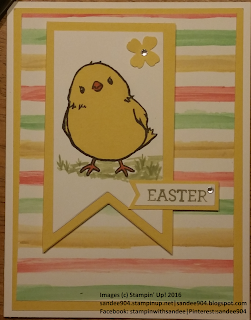 The easter tag is from the Crazy About You stamp set. Hopefully, I will complete the second card yet this weekend and can add a short follow-up post and pictures.